When it comes to the quality of health care, there are two Americas. In one America, infant mortality, avoidable deaths, health-care costs and other measures are far worse than in the other America, according to a new study by the Commonwealth Fund, a health policy research firm. And thanks to Republican lawmakers and the Supreme Court, the gulf between them may only get wider. The map below from the Commonwealth Fund shows the stark divide. States with the worst overall health care systems -- as measured by factors like the number of insured adults and children, avoidable emergency room visits and access to affordable care -- are dark blue. States with better health-care systems are white. When it comes to things like health care access, quality and cost, certain states can be as much as eight times better than others, the report found. Many of the lower-performing states have higher rates of early deaths that could have been prevented by access to quality health care. 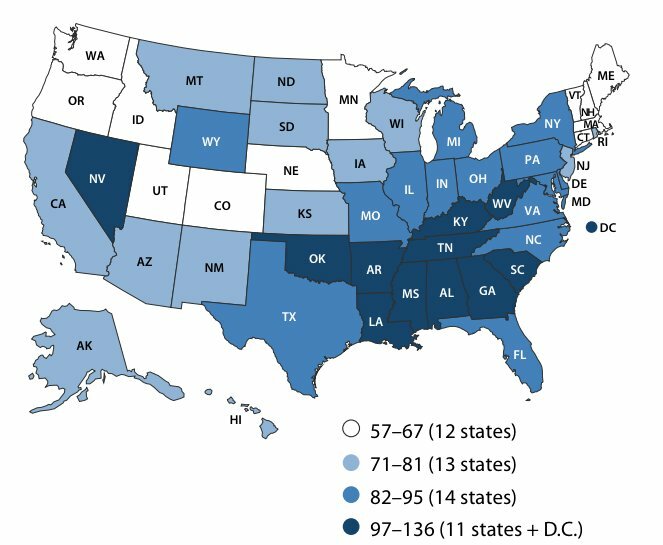 The Commonwealth map below shows the number of avoidable deaths per 100,000 in each state. What's more, 16 of the 26 states at the bottom of the Commonwealth Fund’s scorecard aren’t expanding Medicaid under the Affordable Care Act, also known as Obamacare. Map via The Advisory Board. 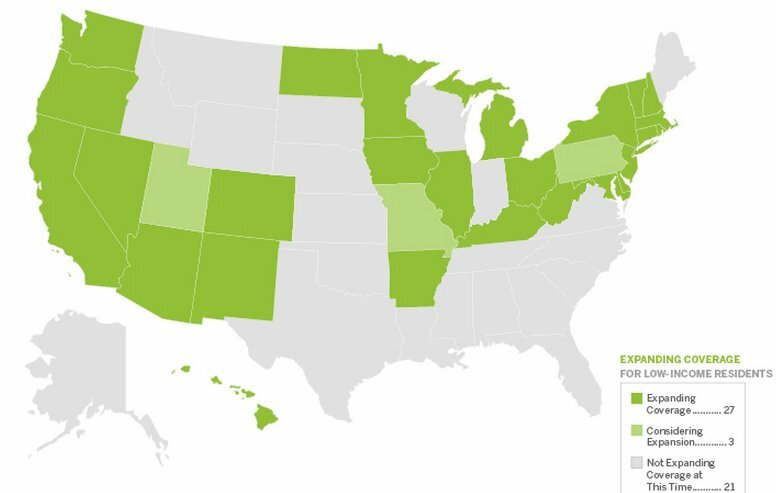 The states in grey aren't expanding Medicaid. Many of these are also states in which overall health systems are worse. One of Obamacare’s major tools for giving the poor better access to health care is expanding Medicaid to those making 133 percent of the federal poverty limit -- about $15,521 for a single person -- or less. But the Supreme Court ruled in 2012 that states could opt out of joining the Medicaid expansion and the extra federal money that came with it. Many states with Republican governors or majority Republican legislators have done just that, leaving millions of their residents out of the national effort to cover the uninsured. Increasing access to Medicaid isn't a cure-all for low-performing states, and improving health care outcomes overall will require more than just expanding Medicaid. But it could help, Schoen said. For one, it will extend health coverage to more people, making it less likely that poor patients will head to the emergency room for things other than emergencies. And if more low-income residents can pay for health care, more doctors might be convinced to move to poor or rural areas. 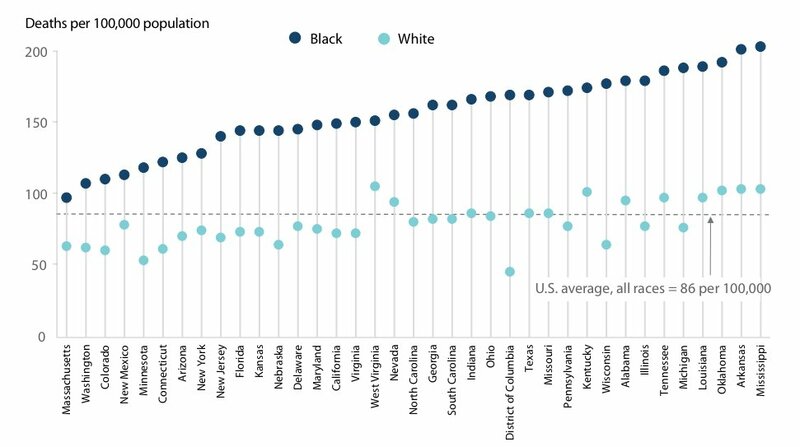 The difference in avoidable death rates in white and black populations in different states. 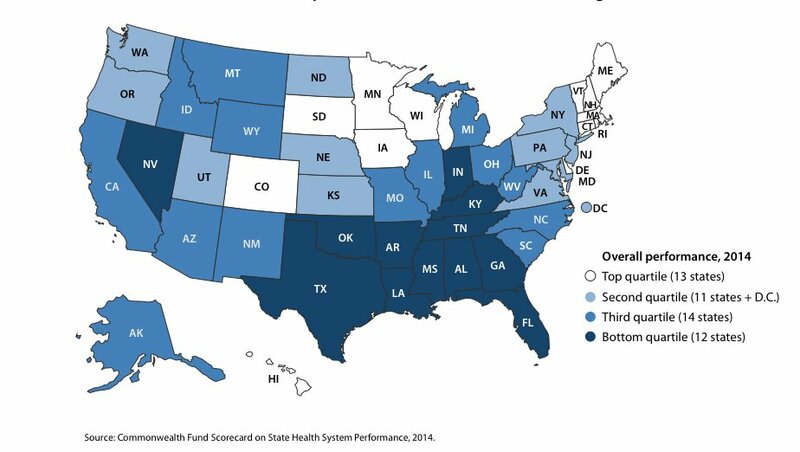 Still, there is some hope: Kentucky, Arkansas and Nevada, which all rank in the bottom quarter of the Commonwealth Fund's scorecard, are expanding Medicaid. That could help them catch up. "You could see a few states start to improve quickly," Schoen said. CORRECTION: An earlier version of this post included a map that indicated New Hampshire isn't expanding Medicaid. The state opted into the Medicaid expansion on March 28.